Another winner from the Chicago based Salem label, this 45 has a lot of good things going for it. 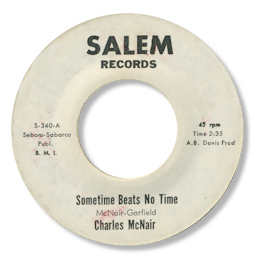 On Sometime Beats No Time there’s the swirling organ and the splendidly out of tune barrelhouse piano – not to mention Charles' gritty tough R & B styled vocal. Check out those great screams near the end. The release under his full name is over a minute shorter than the Charles & The Esquires 45 and also has an added tenor sax. So my guess is that the Esquires disc must have been the first issue - and that is the one you can listen to here. Could the “B Davis” credited as producer be this Benny Davis also on Salem?